Find artworks, auction results, sale prices and pictures of Konstantin Ivanovich Gorbatov at auctions worldwide. 20. GORBATOV, KONSTANTIN (1876–1945) Trinity Lavra of St Sergius in Winter, signed and dated 1923. Oil on canvas, 85.5 by 109.5 cm. 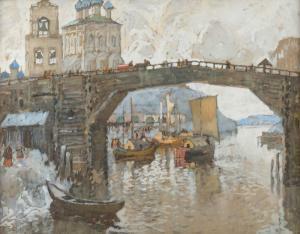 Provenance: Russian Art, Sotheby\’s New York, 16 April 2008, lot 53. Acquired at the above sale by the present owner. Private collection, Europe. Authenticity of the work has been confirmed by the expert V. Petrov. Exhibited: Les artistes russes hors frontière, Musée du Montparnasse, Paris, 21 July–31 October 2010. Literature: Exhibition catalogue, A. Hofmann, V. Hofmann, G. Khatsenkov, Les artistes russes hors frontière, Paris, Edition Paradox, 2010, p. 118, illustrated. The view of the snow-bound Trinity Lavra of St Sergius is among the most recognisable and best-loved pictures in Konstantin Gorbatov\’s oeuvre. The artist\’s legacy contains many depictions of the monastery, which is one of Russia\’s most important spiritual centres, as well as landscapes featuring Sergiyev Posad and its environs. 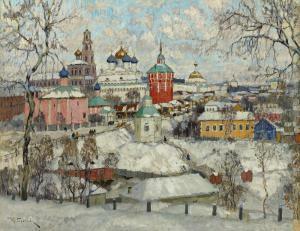 However, the 1923 panorama Trinity Lavra of St Sergius in Winter, now offered for auction, is one of the most successful compositions in this series. Historic Russian cities became the artist\’s main subject after he had returned from Italy in 1913. He managed to brilliantly adapt his painterly style, which had taken on its distinctive shape in sunny Italy, and his bright, fresh \“Mediterranean\” palette to the painting of the rather different features of his homeland. Gorbatov\’s views of ancient Pskov, Vologda and Novgorod quickly earned him acclaim of an artist celebrating the \“Old Russia\” (G. Gaevsky, \“Russkie shkoly zhivopisi\”, in Rossiia v eio proshlom i nastoiashchem, Moscow, 1914), and enabled him to embrace the artistic principles of the Union of Russian Artists. It was around that time, in the 1910s, that the first views of the Trinity Lavra of St Sergius appeared, painted with free, dynamic brushstrokes. From then onwards, the image of the \“heart of Russian Orthodoxy\” remained for many years one of the most important iconographic motifs in Gorbatov\’s work. In Trinity Lavra of St Sergius in Winter, the artist creates a striking image that combines a realistic portrayal of the monastery with a romantically exalted generic vision of Old Russian architecture rendered within a wintry countryside. Despite the overall decorative approach, Gorbatov reproduces the topography of the monastery with high accuracy, correctly positioning the Lavra\’s main buildings — the Church of St Paraskeva Pyatnitsa and the Church of the Presentation, the refectory with the Church of St Sergius of Radonezh, the Cathedral of the Assumption, the belfry and the Church of the Nativity of St John the Baptist. However, the resulting composition is much more than a mere panorama of the monastery\’s walls and churches. 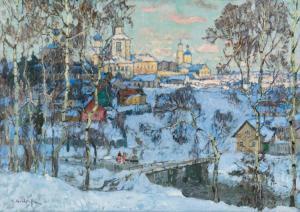 Gorbatov allocates a substantial space in the foreground to the snowy slopes of the river Konchura, frames the composition with the birch trees, and enlivens it with the ragged white clouds covering a lofty expanse of sky and the small yet vivid staffage figures of local people or pilgrims making their way along the paths. Painted in an unrestrained manner with sweeping, soft brushstrokes, the present composition stands out for its freshness of colour, characteristic of the artist\’s best canvasses, an overall thrilling colouristic approach and an exquisite, sensitive rendering of light and air. 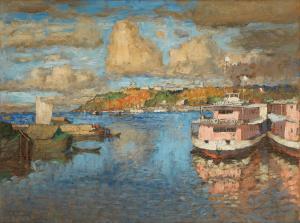 It is undoubtedly a work that deserves to be in the best collections of Russian art. CONSTANTIN IVANOVICH GORBATOV 1876 Stavropol (Toljatti) - Berlin 1945 STADTANSICHT MIT SEGELBOOTEN UND KIRCHENARCHITEKTUR A VIEW OF A CITY WITH SAILING BOATS AND A CHURCH Aquarell, Gouache auf Karton. 50 cm x 64,5 cm. Hinter Glas gerahmt. Unten links in Water colour, gouache on carton, 50 by 64,5 cm, lower left in Cyrillic signed and dated ' K. Gorbatov 1925'. Partially with minimal losses of the paint, behind glass. Konstantin Ivanovich Gorbatov (Russian, 1876-1945) A view of Nizhny Novgorod signed in Cyrillic and dated '1921' (lower left) oil on board 31.5 x 41cm (12 3/8 x 16 1/8in). Footnotes Provenance Gifted by a Russian patient to a Spanish doctor Thence by descent to a private Spanish collection The present lot will be added by Olga Sugrobova Roth to the database of works by Konstantin Gorbatov for the catalogue raisonne currently in preparation. VIEW OF JERUSALEM Konstantin Ivanovich Gorbatov 1876-1945 signed in Latin l.r. 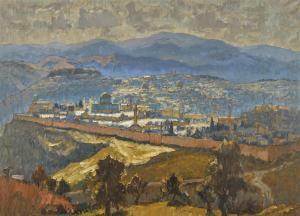 ; further signed, inscribed Jerusalem and dated 1934 on the reverse oil on canvas 78.5 by 109cm, 31 by 43in. Exhibited Possibly London, The Cooling Galleries, Paintings and Drawings of Italy, Palestine and Russia by Konstantin Gorbatoff, 22 April - 25 May 1937 Catalogue Note In 1934 Gorbatov sailed to Palestine via Greece. The trip was to have a profound influence on him andprovided inspiration for a series of paintings: \‘For me, as an artist, the trip to Palestine was a true revelation; nature showed me wonders, combinations and contrasts beyond anything I could have dreamt of before\’. He was also struck by the beauty of Jerusalem: \‘The suburbs of Jerusalem are indescribable in terms of their unexpected forms and colours [...] The shapes of mountains, hills and horizons are so original and at the same time simple [...] the colours are hot: all shades of brown, yellow and orange, one tone changes subtly to the next, like a charmed Eastern melody, whose sounds modulate and die out\’ (cited in Konstantin Gorbatov, The New Hermitage Museum, 2003, p.18). In 1937 Gorbatov held a solo exhibition in London, where he showed a group of works inspired by his trips to Italy, Palestine and Russia. The exhibition catalogue mentions threeoils titled Jerusalem.